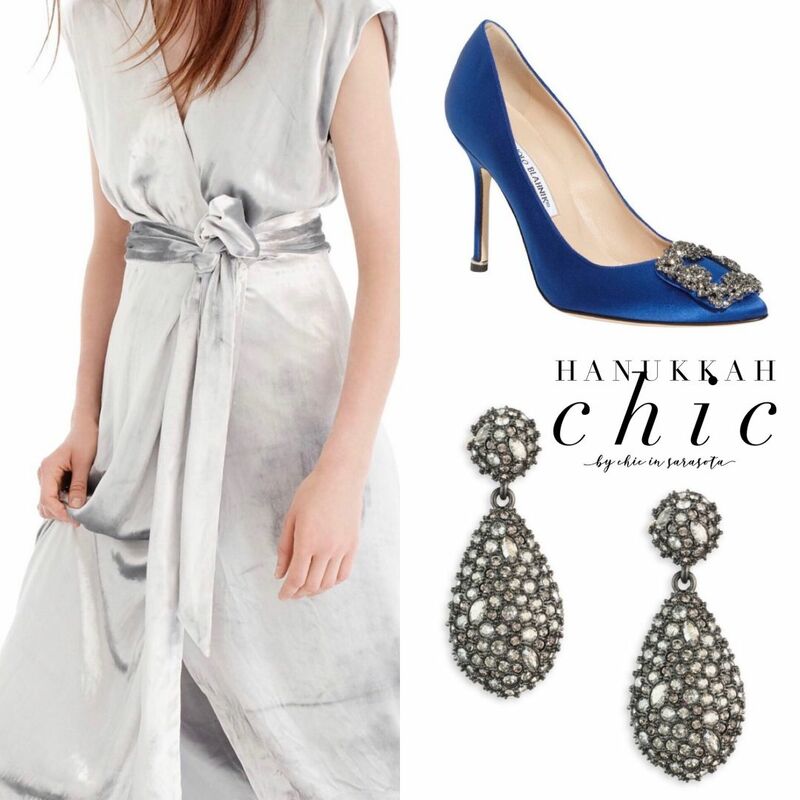 For today's post, I'm styling outfits for a holiday that I've admittedly never dressed for myself: Hanukkah. Hanukkah starts early this year, on Sunday, Dec. 2, and I live for seeing my Jewish friends' posts on social media during the holiday because it looks like they're having so much fun. And as with any holiday or occasion, my first thoughts is always,"What to wear?" 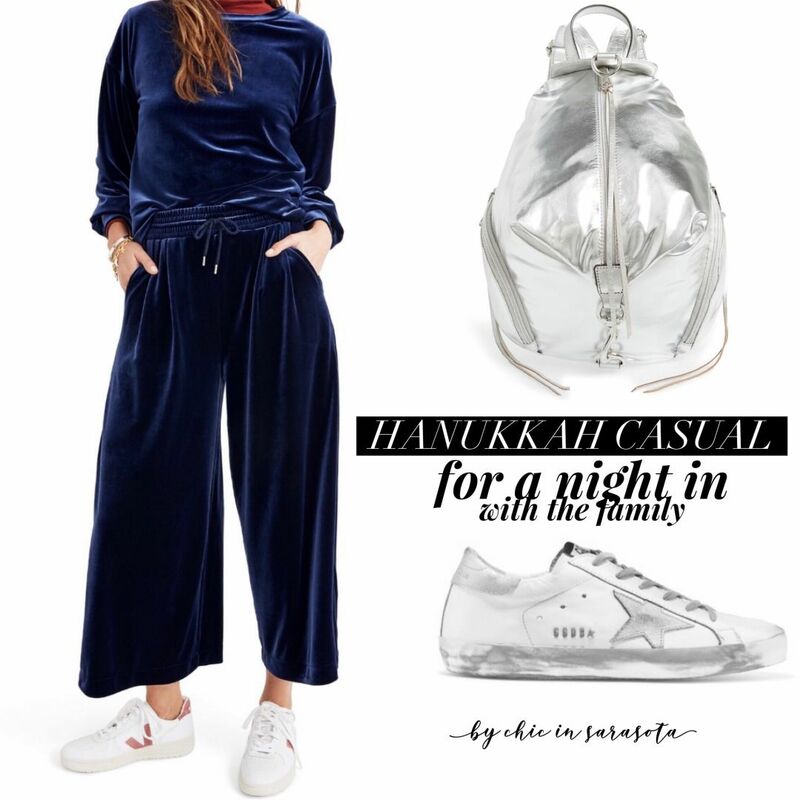 With eight nights of festivities, Jewish women have a lot of outfit planning to manage. Even those without a calendar full of parties and celebrations have eight days to don pieces showing their "challah-day" spirit. 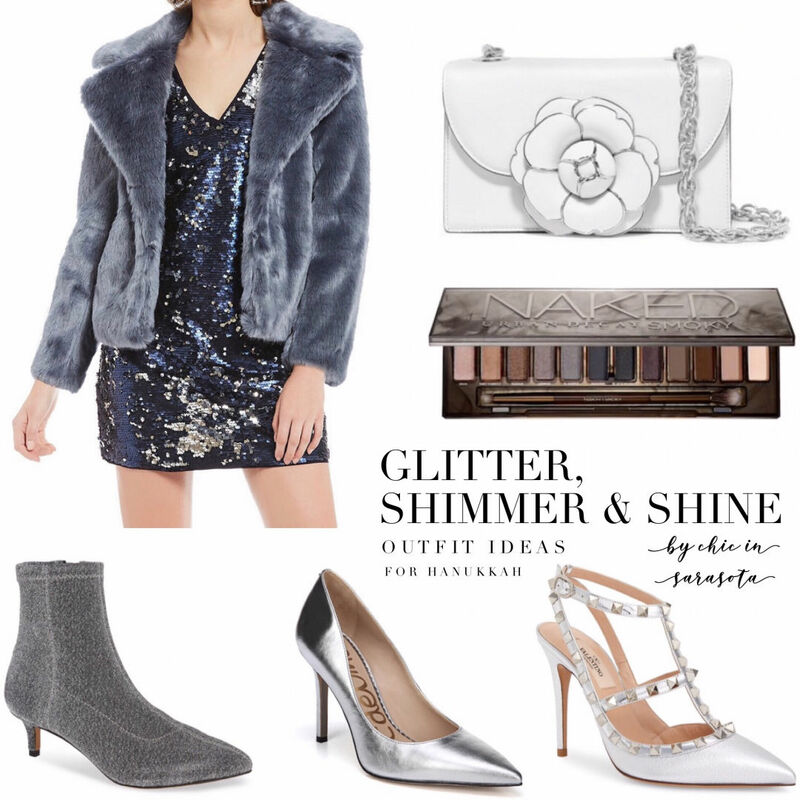 So in honor of the Festival of Lights, I decided to style some outfits that I think are perfect for the holiday—whether you're keeping it casual or headed to a more formal party or dinner. 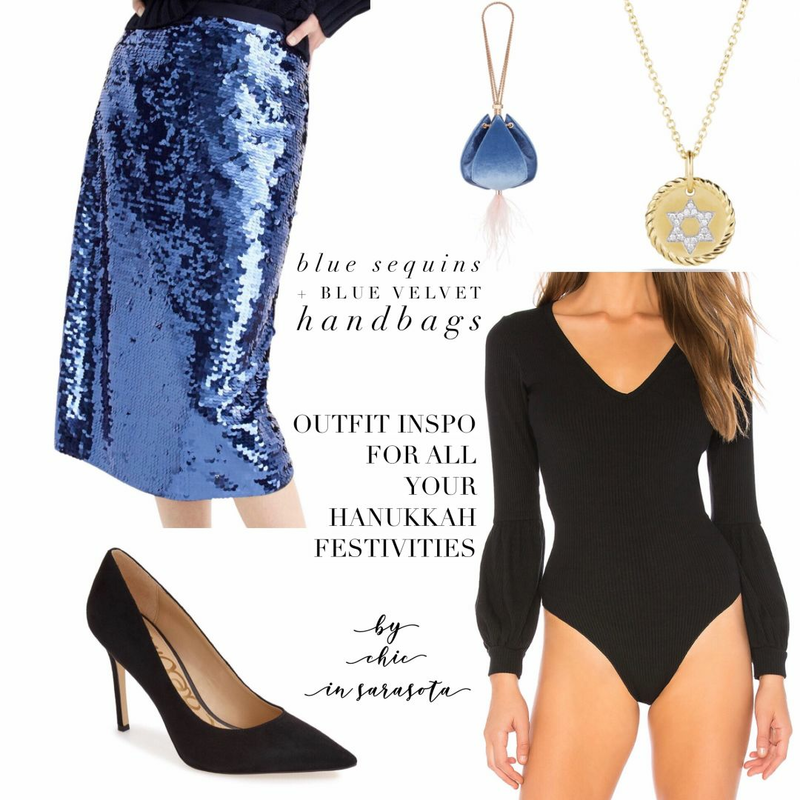 And that’s not all—some of the most fashionable Jewish women in town have joined me to share their favorite Hanukkah fashions and traditions. And below, three fashionable Jewish women share their favorite holiday traditions. 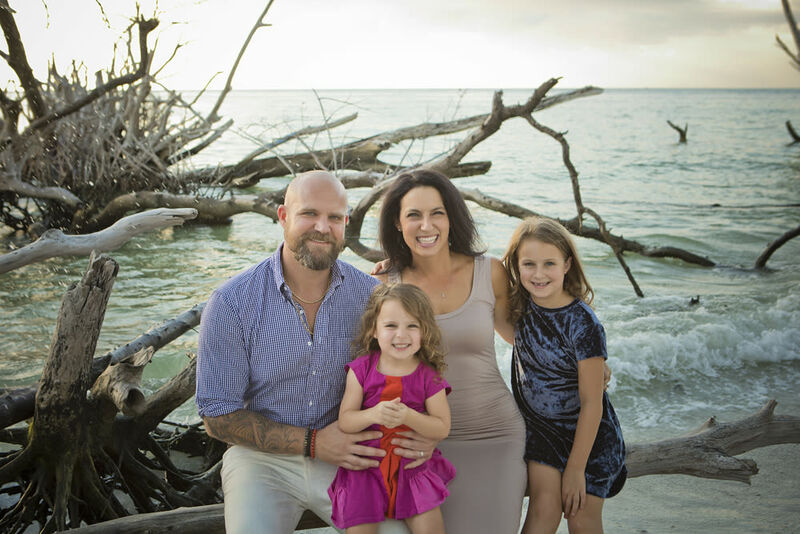 Dave and Kyla Weiner with their daughters. Kyla breaks down her Hanukkah essentials. Hanukkah Jammies for the Family, $44 at Hanna Andersson. "[My husband] Dave said no way—but at least the kids will look cute! These jammies are made of organic cotton and certified by OEKO-TEX standard 100. Cuteness without chemicals!" Invisibobble Hair Ties, $8 at Ulta Beauty. "As someone who accidentally caught her hair on fire by leaning back into a menorah, I always keep my hair back for the ceremonial lighting. It's also necessary when frying latkes, so your hair doesn't smell like fried oil. Best part—no creases, so you can put your hair down for the rest of the night!" Young Fabulous & Broke "Yumi" Dress, $207 at Influence Style. "Incredibly cute, stylish and very forgiving — it allows you to eat lots of latkes and jelly donuts and still look cute." Jessica Simpson Rivera Platform Bootie, $130 at Nordstrom. "These super-comfy shoes will allow you to stand for hours and still feel your toes! They can be dressed up or down, they give you a fall/winter look, and you still get air flow to your legs for the 85-degree Florida holiday parties." Hanukkah paper party goods at Target. "Target—my happiest place on earth—of course comes through with the most adorable paper party goods. They also have fun, reasonably priced decor options if you're hosting a party or the kids want to decorate the house." 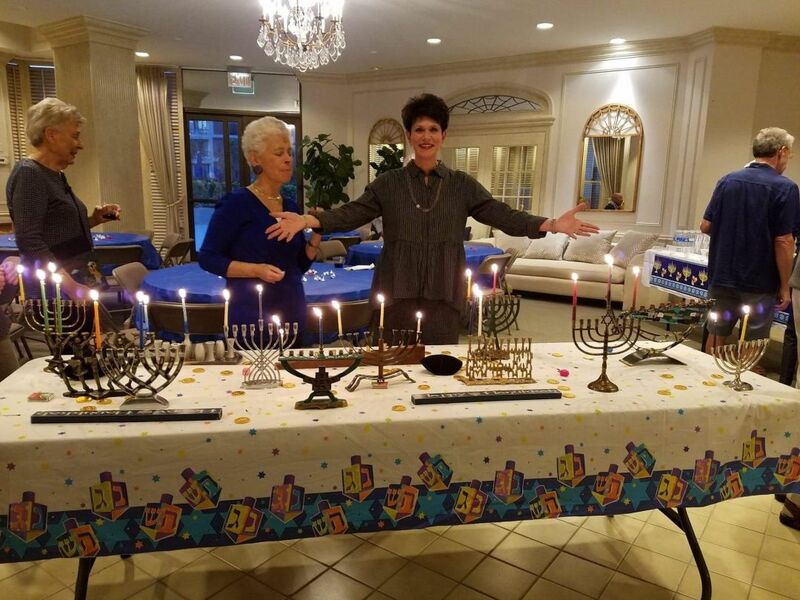 Every year, Wendy Feinstein hosts a Hanukkah party for her entire condo building on Longboat Key—she brings the fashion and latkes for all. 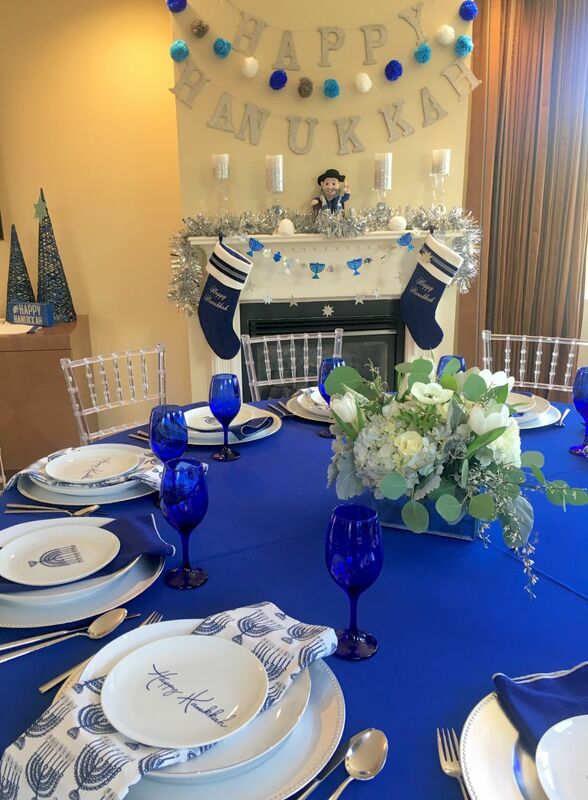 "We throw a candle-lighting ceremony and party in our condo building, where everyone brings their own Hanukkia [menorah] to light their own candles. [My husband] Jerry always does a reading having to do with Hanukkah—sometimes humorous, sometimes informative—and we serve over 100 potato latkes. It's really wonderful and well-attended by both our Jewish and non-Jewish neighbors. 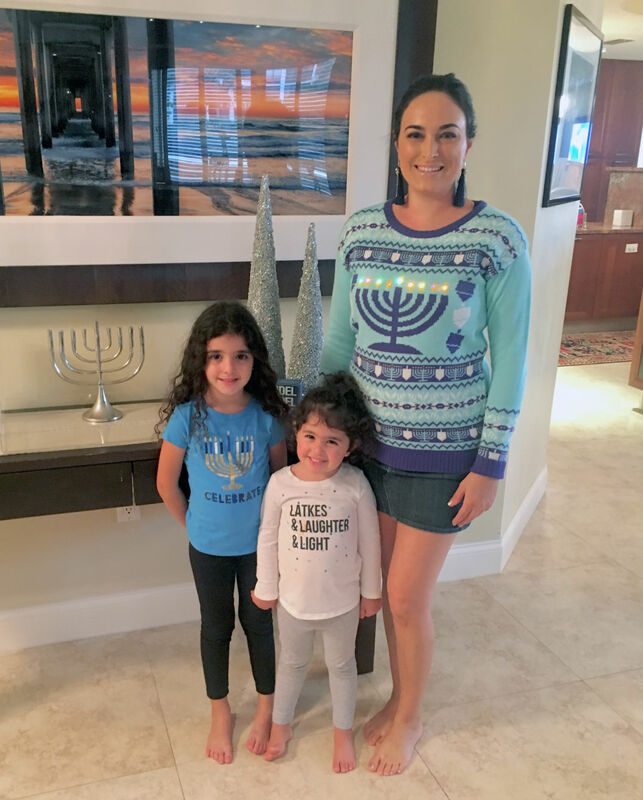 "I always take my mom's menorah to light, in addition to ours. The tradition is that you don't blow out the candles, you let them burn out. The first year after my mom died, I took her menorah to light. The party was over, everyone had gone home after their candles burned out—and I had to stay an extra 45 minutes because my mom's candle was still burning brightly!" 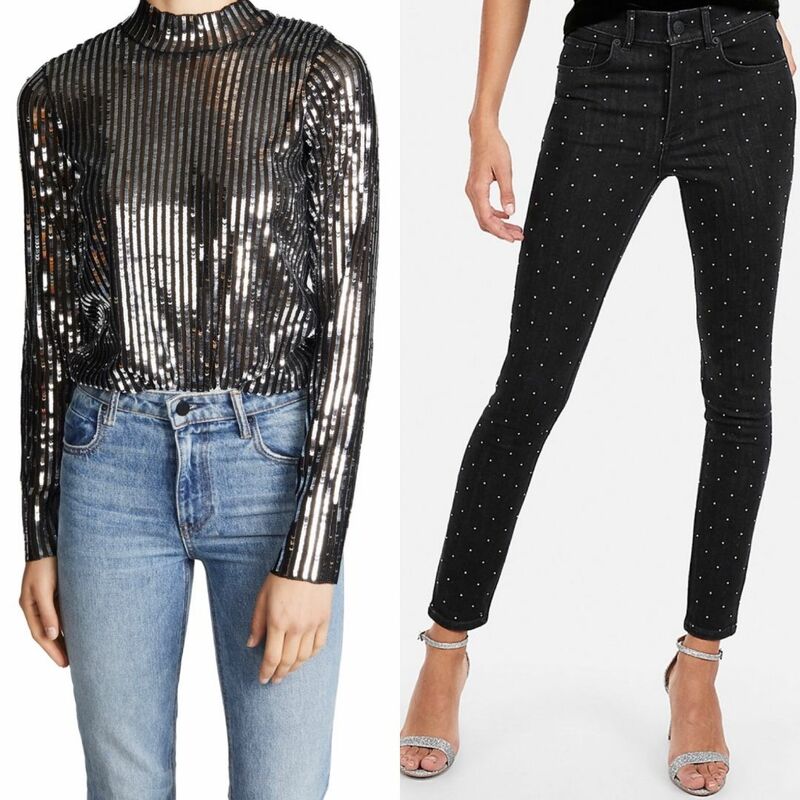 Every year, silver and sparkly is a must at Hanukkah, and this year's selection is crystal embellished jeans and a sequin top. Sepi Ackerman married into a Jewish family—and might have the most holiday spirit of all. "Hanukkah, the other holiday in December. Once upon a time I grew up celebrating Christmas—with the bright twinkle lights, the beautiful Christmas tree and Santa. Then I met my husband and we started a Jewish family...which I was initially less than excited to celebrate, because how could you compete with Christmas? It's practically in your face right after Halloween. "But then I realized: I will not let my kids grow up where Hanukkah is any less fun or full of tradition than Christmas. So, the obsession started to make Chanukkah the most amazing holiday. I scour the tiny end cap of options in each store—Michael's, Target, Party City, Home Goods, Pottery Barn, Pier 1 imports, Crate and Barrel. Each year, I add a little more to my collection and now I'm at a point where you can walk into my home and think, 'Wow, this is a Hanukkah wonderland!' Who needs Elf on the Shelf when you have Mensch on the Bench? "But it's more than just decorating. We light the candles each night. I make sure we do this each of the eight nights, and it's important to make sure we are around friends or family for each of them. We make every effort to do so because being around people you care about is important, and we share these nights with Jewish and non-Jewish friends alike. I also make sure I do a little something special for Hanukkah in each of my girls' classrooms. Most times, my daughter is the only Jewish girl in her class, so I want her to know we are proud and it's important to let her friends understand what it is she celebrates. And last but not least, we always celebrate Christmas too, but with friends who do so in their home. Embracing one another is very big to us and understanding acceptance is what we teach to our children."